"Mega Man, once again you must save the world, because Dr. Wily just won't stop! This time the unbelievably insane scientist has restored eight of the Robot masters you previously mashed into metal marmalade. Four of them - Ice Man, Electric man, Cut Man, and Fire Man - are running wild and tearing up the town. Those are the nice ones! Another four - Quick Man, Heat Man, Bubble Man, and Flash Man - are lurking in Dr. Wily's complex, with a factory-full of industrial strength robot smashers that you won't believe! But that's nothing compared to what you'll face in Dr. Wily's Space Node. So load up the Plasma Cannon, Mega Man. It's time to get the lead out!" --From the Gameboy Mega Man - Dr. Wily's Revenge instruction manual. Play Mega Man - Dr. Wily's Revenge Now! and the game play is great. 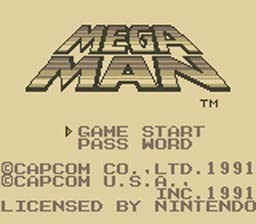 Mega Man: Dr. Wily's Revenge is a must play for any Mega Man fan. Run, jump, and shoot your way through all of Dr. Wily's levels to save the world.